Project management is a greatly underestimated function in translation but one which makes the difference between professional language services and just being an intermediary. It is a rare instance when a client calling a translation agency is aware that they are not speaking to an actual translator so the idea that translation is a project that needs to be managed is still unfamiliar. The reason is that a translation client is interested in the result -a document in another language- rather than the mechanics involved in the process. Formatting the document, finding the segments that need to be translated, tracking changes, ensuring consistency with other documents or dealing with a hundred pages by the next day are all incidental for the client. Those “incidentals”, however, are exactly why translation is a complex project rather than a one-man show. I attended Elia’s Focus on Project Management conference in Barcelona on 1- 2 December. This was possibly the first industry event devoted specifically to project management and it further convinced me how important professional management of translation projects can be in delivering quality to our customers. Assessment: There needs to be a person who takes all the information into consideration and assesses that against the client expectations and deadline. Planning: A translation project comprises more than just translation. Documents need to be converted to editable formats, style and terminology guidelines need to be prepared, different time zones may need to be taken into account. All this plays a role in developing a translation project timeline. Assigning and monitoring: Depending on the deadline, a project can be assigned to one translator or a team that needs to be carefully coordinated to ensure terminological consistency. As translators are human, and are prone to error a professional language service provider limits the risk of mistakes by engaging another linguist to perform an independent revision and additional quality assurance procedures. Delivery: Before sending the translation to the client, a project manager ensures that all project requirements have been met. Juggling: Project management in translation can be more challenging than project management in other industries as the life of a project is typically very short, customization is frequently required and a project manager is managing several projects on a daily basis. Follow ups: In addition to that, the management of a project does not finish when a translation is delivered, as the project resources such as terminology, specific style guidelines or reference material need to be recorded and managed for use in future related projects for the same client. Giving feedback: Project managers ensure that the translators and proofreaders and verifiers receive feedback, which builds their professionalism and adds value on such future projects. Negotiating: A project manager negotiates continuously – with the sales team or the client to ensure an optimal quality – price – time ratio; with the translator(s) to ensure that the translation is prepared according to the guidelines; with other linguists to ensure that the translation can be properly reviewed, and finally QA’d. 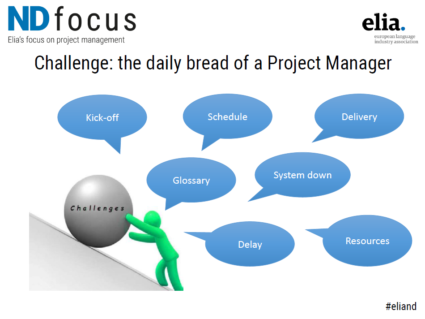 Knowing how this is frequently not picked up on by clients, it was all the more interesting to attend Elia’s ND Focus on Project Management . The event highlighted the importance of asking questions instead of making assumptions, helping to arrive at win-win solutions even in very difficult circumstances. Another workshop highlighted the cultural differences in the planning and risk management process encountered when we collaborate with linguists from all over the world. Yet the best aspect of the event was the possibility to exchange experiences and gain inspiration to develop better solutions. I came back full of ideas and hope that the project manager’s role in translation will finally be properly recognised and that there will be more opportunities to share our experiences with other project managers as well as linguists and clients. Best practices, Lacrosse approach #eliandfocus, Alexander Freeland, Giovanna Draghi, Karim Benammar, language services provider, Loes Husain-Cornelissen, LSP. Elia, multilingual, project management, Romina Kohej, terminology, translation. permalink.